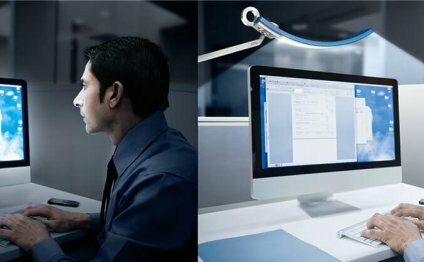 The clean and simple Equo Gen 3 Desk Lamp features a discreet counterweight design for feather-light adjustability. One little finger is perhaps all you will need to adjust the drifting supply's position, therefore the tilting mind stays at whatever position you put as soon as the supply is raised or lowered. The touch sensitive and painful control strip is located in the stem for easy accessibility and includes a 7.5" table base. Slide your hand across the strip to dim slowly, or touch anywhere in the strip to leap straight to any brightness, including down. Head is rotatable in 180 levels and is removable for simple replacement. Appropriate for Optional Occupancy Sensor. LED Rated Lifespan of 50, 000 hours. Supplied with Warm (3500K) or Daylight (4500K) shade temperatures. For sale in Ebony, Silver, Orange or Chrome steel finishes. Supplied with a 9 ft black cable. Winner associated with the 2011 Red Dot Design Award. Winner of this 2011 Bloom Award. Finest in course 2010 Next Generation Luminaries.